Inc. Black fur vest. Shipped with USPS Priority Mail. Blonde mink fur and white leather in between the coat. L ining has a tan floral silk lining with a few light stains as shown in photo. SIZE�CHART PREVIOUSLY OWNED/WORN; DIRT/MARKS AND SNAGS IN VARIOUS AREAS INSIDE LINING FROM WEAR. MISSING FUR ALONG POCKET TRIMS. SEE PHOTOS. SIZE�CHART. PREVIOUSLY OWNED/WORN; DIRT/MARKS AND SNAGS IN VARIOUS AREAS INSIDE LINING FROM WEAR. 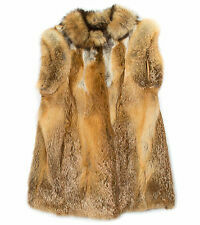 New ListingStylish Red Fox Fur Coat Jacket - Medium - VERY WARM!! Condition is Pre-owned. Back Shoulder (top of sleeve) 14"-15". Arm Pit to bottom is: 34". Beautiful fur over shoulder shawl. Full fur coats being in the 10k range. initials embroidered in the underside. beautiful original condition. It is perfect for dresses, gowns, suits, coats and jackets. It is made of non woven, water resistant, breathable fabric. Made In Italy Of Benetton Fur Jacket. Shipped with USPS Priority Mail. Ivory Vintage White Rabbit Fur Hook-Closure Winter Short Jacket Coat SZ M/L. Condition is Pre-owned. Shipped with USPS Priority Mail. The inside has a black silk lining in great cond! 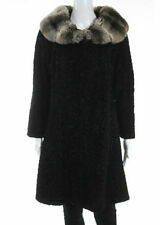 Adrienne Landau Women's Black Rabbit Fur Collar Vest Coat Size Medium. Condition is Pre-owned. Shipped with USPS Priority Mail. PLEASE NOTE THE ARMPIT ON SIDE NEEDS TO STITCH UP IT HAS A SLIGHT TEAR!!! 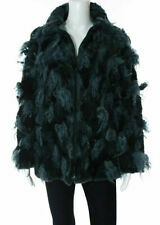 Does not affect the ear of the coat it is beautiful rabbit fur vest!! No returns so please be willing to buy and repair or wear has is! It does have initials sewn in.No holes, No brittleness, No Stains, No Yellowing, No Shedding, No Bare Spots, No odors. Label Wilibel New York Paris Maas Brothers of Florida - Fits an approximate varied One Size Fits Most range. Embroidered with Initials SMM📸 Was Tailor-Made. "🎬When you wear this type of elegant coat you're sure to stop the Traffic! Length, shoulder to hem: 46". Sleeve, armpit to end of cuff: 15". Condition :Good Condition. This is a gorgeous piece in a rare and beautiful dark navy blue. Perfect with jeans or pants and a great top. Has a hidden navy clip to keep it closed or leave it open. This piece is perfect, fabulous and new. 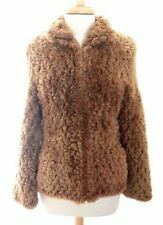 NWT Fredini sweater with rabbit fur front, cable knit sleeves and in the back. Full zipper front. Material: 80% Rabbit fur, 14% acrylic, 6% wool. Color: Black. Length: 22". The hood is removable. The color is an olive/khaki. This is a nice and warm coat! Thick and heavy Fox coat, Its in great condition. Coathas 2 large silk pockets in front and end of left sleeve shows wear as shown in photo. Features three eye closures and three hook closures. The inside has a brown silk lining with a slit tear but other than that lining is in great condition! Worn only a couple times. Great condition. As the weather cools down, coats offer protection from the elements. There are so many types for women to wear, including hooded parkas, reversible coats, fur coats with tall collars, and jackets. Fur coats and hooded parkas are especially warm as they are made up of the fur that animals use to stay warm each winter. What kind of fur is used for fur coats? Women's fur coats come in a variety of styles. Women can wear mink coats, black hooded parkas with a fur trim, short black fur jackets, or even a white fur collar on a black coat. Fur coats are typically made of fox, rabbit, lynx, mink, muskrat, beaver, otter, sable, seals, cats, dogs, coyotes, chinchilla, and opossum. Fur coats are typically chosen for their quality, color, and pattern. Some animals such as sheep are used more often for fur and known as shearlings. The white wool from shearlings can be shaved several times a year to produce more fur coats from one shearling. Coats and jackets are mainly distinguished by their length: A jacket rests on a women's waist while a coat is longer. Jackets are also considered less insulated, lighter, and tighter-fitting than a coat. Coats and parkas are usually worn to provide warmth during the winter while jackets are sometimes worn in spring or autumn weather because they don't provide as much warmth and can even be worn simply for fashion. What is faux fur made out of? 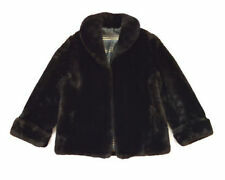 Faur fur is a textile fabric that women can wear to resemble real fur. It is usually composed of polymeric or synthetic fibers. It can be dyed brown or black to resemble a mink coat or gray or black to resemble a rabbit, for example. A faux fur mink coat could be indistinguishable from an authentic coat to the naked eye, but it should have a tag stating that it is faux fur. What is leather made out of? Leather is made by tanning the skin of an animal. Examples include cattle, pigs, goats, sheep, crocodiles, snakes, sting rays, seals, emus, deer, fish, kangaroos, and horses. It is often used for women's coats and jackets to provide protection against water and wind. Like faux fur, there are products made from faux leather rather than genuine leather. Typically, faux leather is made of fabric that is treated with wax, polyurethane, or dye, and it is easy to clean when used to make a women's coat.